The Oaxaca Guerreros continued their unlikely postseason surge by defeating the Mexico City Diablos Rojos, 8-4, Sunday in the nation's capital to clinch the Mexican League's South Division Championship Series, 4 games to 2. The Guerreros move on to the Serie del Rey title set against the Monterrey Sultanes, starting Tuesday night at Estadio Monterrey. Oaxaca barely qualified for the Fall 2018 postseason after finishing fifth in the LMB South with a 26-30 record, one game behind 26-28 Leon. That margin was close enough to force a single play-in against the Bravos in Leon. The Guerreros won that contest and went on to eliminate defending Liga champion Yucatan in seven games in the opening round to set up the division title series with sister club Mexico City (both teams are owned by billionaire Alfredo Harp Helu). 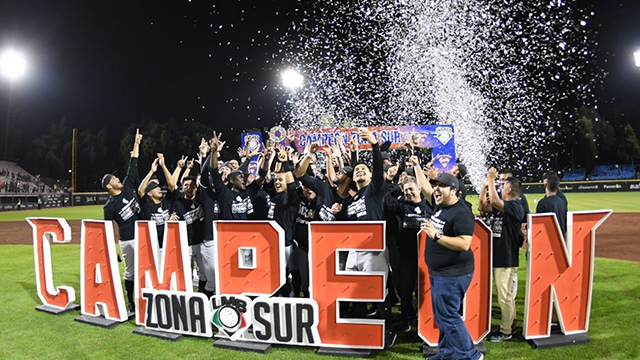 After knocking the Diablos out, the Guerreros will now seek their second LMB pennant, the first coming 20 years ago under manager Nelson Barrera in the team's third season in the Liga since Harp led a group of investors in purchasing the Jalisco Charros following the 1995 season and moving the franchise to Oaxaca. The Warriors have not won a division title since until now. Manager Sergio Gastelum took the reins from former skipper Joe Alvarez in the middle of the fall campaign and while the team continued to struggle the rest of the regular season, Gastelum has them playing well at the right time. 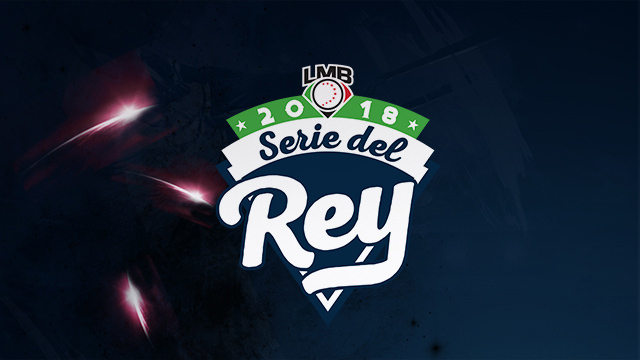 The Guerreros will face a Monterrey team that reached the Serie del Rey in the Spring season, losing to Yucatan to fall short of winning the Sultanes' tenth pennant. Monterrey finished the regular season with a 34-23 record, good enough for third place in the LMB North under first-year manager Roberto Kelly. Like Oaxaca, the Sultanes were stretched to a seventh game in the first round before defeating rival Tijuana to move on to the division championships against Monclova. Monterrey had an easier time of it against the first-place Acereros, who had the Liga's best regular-season record with a 42-14 mark to win the top seed by seven games over second-place Tijuana (35-21). The Sultanes knocked off Monclova in five games to reach the Serie del Rey for the second time in the calendar year, a record that will stand for some time to come now that the LMB is abandoning its two-season format in 2019 after one year. Monterrey swept Oaxaca in three games at home in July (the only time the two teams have met in either 2018 season) and is likely favored to win their first pennant since 2007, but anything can happen in a seven-game series and Oaxaca has defeated two good teams to reach this point. 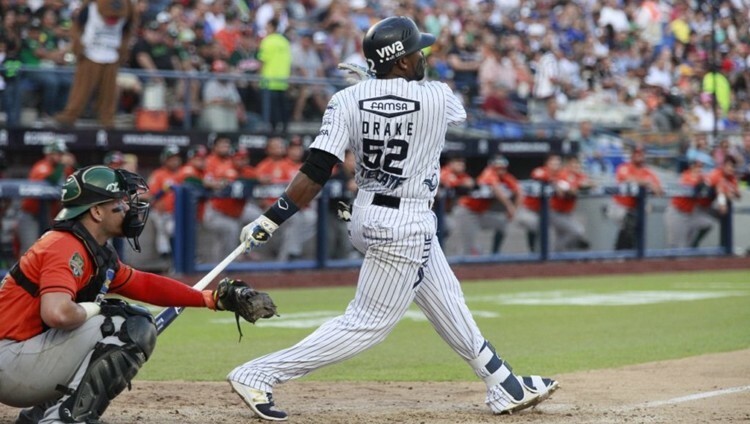 The Oaxaca Guerreros overcame a midgame 3-1 deficit by scoring a combined seven runs in the sixth and seventh innings to defeat the Mexico City Diablos Rojos, 8-4, Saturday night in front of an overflow crowd of 6,400 at Estadio Fray Nano in Mexico City. The win gave the Warriors a 4-games-to-2 win in the LMB South championship to punch their ticket to the Serie del Rey against Monterrey. The Diablos drew first blood with three runs in the bottom of the first inning. Juan Carlos Gamboa lined a single up the middle off the glove of Oaxaca starting pitcher Irwin Delgado to plate speedster Carlos Figueroa from second with the game's first run. David Vidal singled Gamboa to second and both runners crossed the plate on a Luis Jimenez triple to put Delgado and the Guerreros in an early hole. Henry Urrutia got one run back for the visitors by belting a leadoff homer in the top of the second but Mexico City's 3-1 advantage held until the sixth, when the Guerreros pasted Diablos starter Patrick Johnson and three relievers for four runs on as many hits. The key blows were back-to-back doubles by Dustin Geiger and Julian Ornelas, the latter a liner to center that drove in Yuniesky Betancourt and Geiger with the go-ahead tallies. Mexico City came back with a run in the bottom of the sixth Gamboa singled to right off reliever Samuel Zazueta to bring Jesus Fabela motoring in from second to cut Oaxaca's advantage to one run, but that was as close as the Diablos would get the rest of the game. The Guerreros scored three more times in the top of the seventh as Ornelas contributed a two-run single off David Reyes to bring the score to 8-4. From that point, relievers Erick Casillas, Rodolfo Aguilar and Carlos Felix blanked to hosts over the final three entradas to seal the win for the Guerreros, with Felix inducing pinch-hitter Ivan Terrazas to ground out to Betancourt at second to end the series in the bottom of the ninth. Ornelas went 3-for-3 for Oaxaca with four RBIs as reliever Ozzie Mendez got the win. Johnson absorbed the defeat for the Diablos. The series was tied at a game apiece before Oaxaca topped Mexico City, 10-3, last Tuesday behind Jay Austin's double and triple with two runs scored and two more driven in. The Diablos came back Wednesday with a 9-4 win at Oaxaca to tie the series back up as Vidal broke the game up with a bases-loaded triple in the top of the sixth to give the visitors an 8-3 lead. Vidal was thrown out at the plate trying to complete a rare inside-the-park grand slam by Guerreros rightfielder Alan Sanchez but the damage was already done. One night later, Oaxaca took the series lead with a 2-1 victory behind the four-hit pitching of starter Jose Medina (6 IP, 3 H, 1 R) and three relievers. Attendance has been traditionally moribund at Guerreros home games but a combined 18,000+ fans clicked the turnstiles at Parque Eduardo Vasconcelos at the three games in Oaxaca before the series shifted to Mexico City for Saturday's fateful Game Six. And now the Guerreros, led by manager Sergio Gastelum, who had never managed an LMB team prior to August 7, are four wins away from hoisting their second pennant in 23 years (and first since 1998). Gastelum had been managing Ensenada in the Northern Mexico League when he was brought in to replaced the fired Joe Alvarez on August 7 and went 12-14 with Oaxaca the rest of the regular season. The postseason has thus far gone a trifle better for Gastelum and the Guerreros. Monterrey had a surprisingly easy time of it against Monclova after surviving a seven-game first-round battle with Tijuana to reach the LMN North Championship Series. The Acereros had dominated the Fall season with a Liga-best 42-12 record (including a 4-2 mark against the Sultanes) and were a favorite to win their city's first-ever pennant heading into the playoffs and did nothing to dispel that by eliminating Dos Laredos, 4 games to 1, in the opening round. However, the Sultanes were able to exploit Monclova's lack of pitching depth to rack up 32 runs over the final four contests of the LMB North championship series to pull away with a 4-games-to-1 win over the Acereros and vault into the Serie del Rey against Oaxaca. The set opened with a relatively normal 4-3 Monterrey win on September 20 in Monclova before the Sultanes bats heated up with a 7-3 triumph at Estadio Monclova on September 21. After the series moved to Monterrey, the Sultanes made it a 3-games-to-0 advantage September 23 and while the Acereros bounced back last Monday with a 9-8 win in Game Four (thanks in no small part to a seven-run fifth inning highlighted by a Juan Perez grand slam and a solo blast Jesus Arredondo), it seemed only a matter of time until Monterrey eliminated the top seed to move on to the Serie del Ray while endangering Monclova manager Pedro Mere's job with volatile owner Gerardo Benvides' Acereros in the bargain. That shoe finally fell last Tuesday, with the Sultanes delivering the coup de grace to Monclova's season with a 9-5 win at Estadio Monterrey with 18,202 onlookers in the stands. This time the big inning belonged to the Sultanes, who were trailing 5-3 before plating five runs in the bottom of the seventh. Yadir Drake's two-run homer keyed the outburst as Mere sent four pitchers to the mound that inning as Monterrey put six hits on the board. Besides Drake's bomb, Felix Perez had a run-scoring double, Chris Roberson drove in a run with a single before coming in on Drake's longball and Ramon Rios doubled before scoring on an Ali Solis single as all nine batters in the Sultanes' order came to the plate. Perez launched a solo homer off yet another Monclova reliever, veteran Mauricio Lara, in the eighth to put the game and series out of reach for the visitors. Lara was the eighth hurler used by Mere in the contest, with the loss going to Arturo Barradas, who served up Drake's homer. The win went to Sultanes reliever Nick Struck, who gave up two runs in two frames but had the good fortune of being on the hill for Monterrey before the Sultanes went on their five-run tear in the seventh. Roberson and Agustin Murillo each had three of Monterrey's 15 hits on the night as the Sultanes batted .320 for the series. And now the Sultanes move on in search of the franchise's sixth title since 1962 and Monterrey's tenth Mexican League pennant since 1943 (the first four won by the old Industriales under manager Lazaro Salazar, including three in a row between 1947 and 1949).